Choose your words carefully today to ensure that they are coming from the heart. There are ways of saying what you need to say without the sting. In this case, jellyfish symbolism is asking you to allow yourself to shine from the inside out. In other words, allow those around you to see who you are. Thus you need to reach out to them with love and affection. Jellyfish meaning is also reminding you that there is no need to feel vulnerable when you come from the heart. Moreover, the heart knows that love is the power and strength from which we all grow. Hence jellyfish symbolism implies that trusting your heart and its guidance is vital for you right now. Therefore, like the swan, you should go with the flow! People with the jellyfish totem know how to use their power of intention. They are also unafraid to allow the Universe to show them the way. Thus they follow their instincts readily and quietly. Often they go with the flow of the Universe. Folks with this spirit animal totem have a great deal of ability to take everything in stride. They enjoy keeping things simple and, like the angelfish totem, are unafraid to explore their emotions. People with this power animal can also tackle difficult challenges quickly and with a minimum of fuss and stress. They are organized, know how to share the workload, trust the processes they involve themselves in and always come from a place of acceptance and faith. When you have a jellyfish dream, it symbolizes the surfacing and healing of painful memories. In other words, like the green jay dream, you are now ready to deal with these aspects of yourself and move on through to forgiveness and love. Thus you need to seek out the light in each memory by focusing on what the lessons that were learned. They are all valuable to you in some way. Conversely, you must also recognize that hidden hostility and aggression will never serve you well. Alternatively, this creature is asking you to look at your self-esteem. Are you feeling somewhat inadequate or uncertain about a few things? Take the time to discover why so that you can feel better about yourself and see the light within yourself. i was trying to ssve them form something then i pet them. Just done a meet my spirit animal guided meditation for the first time found a jellyfish calmly floating in a clear blue sea, gave me an overwhelming sense of relaxation and comfort. Does it mean that’s my spirit animal. If Jellyfish is your animal totem everyone that does not accept you for who you are, will nevertheless be effected by you in some way. Think of a jellyfish swimming peacefully in its own current and someone invading its space – which follows is a sting and reminder not to mess with such a person again. PS: people don’t always have to accept you, as long as you are honest (transparent) to yourself & learn out of your own transparency. Jellyfish came to me as an image during a meditation to connect with 5th dimensional consciousness and the Arcturian energies. Quite a validation…Thank you. 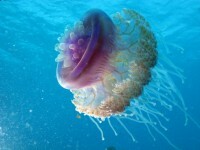 I was stung by a jellyfish a few years ago and the next day discovered I was pregnant. I didn’t think of looking it up until today. Perfect for then and now as well!! Thank you!! I’ve found that totem animal messages have been helpful throughout this huge awakening process I’ve been undergoing in the past year, but this visit from the jellyfish (when I live in the thick of the forested Appalachian mountains next to no sea-water) has brought me to such poignant insight about the trauma that is being raised to the surface to be recognized and healed. Such a beautiful affirmation. Thank you, jellyfish, for sharing your wisdom and supportive insights with me.